Pretty much straightforward if you source beauty or skin care products in pharmacies and drug stores. Stand in front of the shelves, read between and above the lines on the product you are keen, trust your instincts and rely on your years of beauty expertise, knowledge and experience. Lucky you if there's a SA standing by to advice you. Otherwise, your budget and your judgement prior to deciding which product will lend a support for your beauty quest (L'oreal Revitalift Anti-Wrinkle & Firming Eye Cream). Of course, at beauty stores, its a different beauty lingo all together. SA's for listening to your beauty concern and suggestions thrown in as well. But sometimes, not all SA's know what they are talking about. Maybe lack of training on product knowledge and just close the deal for commission earning? Trust me, I know what I am talking about. I have been taken for joy rides too. The latest development took place when I was in a rush for getting an eye cream. Really mad rush. Rush in time and rush for replenishing. My last eye cream left nothing, I literally was on roller blades in getting another. To L'occitane Sunway at the strong suggestion by, later I found out this person is enemy within me who wanted to boost her standing for L'occitane sponsorship, sadly only later I knew, my query to an eye cream clearly made known to the SA's. Two of them. L'occitane Eye Care & Mask Duo Brightening Correction I was told will do justice for my dark circles and tired eyes. I trusted them and I bought. Gone by one week, me applying twice a week and then came the bomb shell. I particularly mentioned eye cream, but what I had in hand is eye care & mask duo. Did I tell them I wanted a duo product? Not as far as I can remember. I know I specifically mentioned, damn, eye cream damn. I know, I agree its slip on my part, I am also aware its an eye cream too, but what the hell was wrong with those face painted SAs?? Utterly disappointing. I believed them until I didn't care about none. Neither did they explain to me how to use it as an eye mask. Any other choice for this RM157.32 product? No. I then told myself I might as well continue using, primarily as my eye cream (La Colline Cellular Eye Mask). Maybe, I will try it for my weekend home facial too. Triple-action formula works both as a daily eye cream and an eye-contour mask for visible results. First, the eye area is smoothed. Skin looks firmer and the appearance of wrinkles is greatly reduced. Second, an even and luminous eye area emerges. The eye contour seems brightened with Bellis Perennis extract. Third, a fresh and rested look is achieved. Puffiness and dark circles due to age, stress and fatigue appear minimized through the action of caffeine. This correction eye treatment contains extract from the Immortelle flower, which never fades, even after it has been picked. 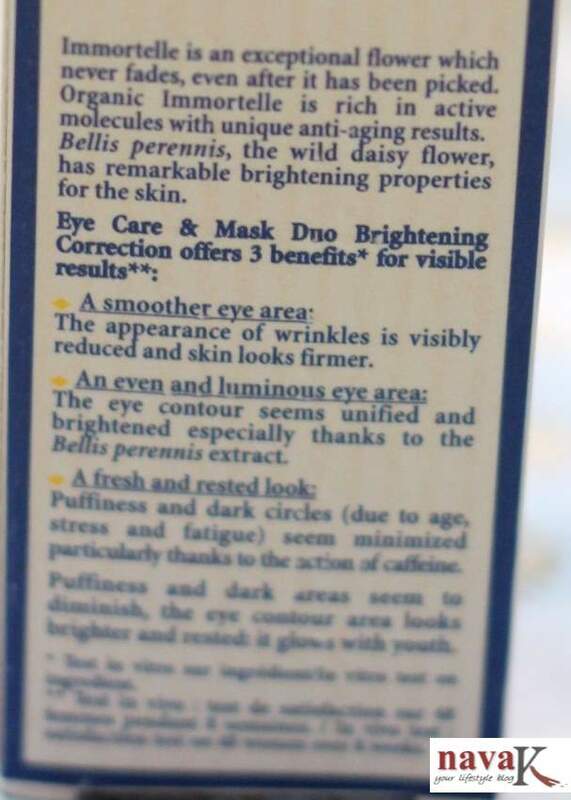 Organic Immortelle is rich in active molecules with unique anti-ageing results. Its organic essential oil is rich in active molecules with unique anti-ageing properties. Over ten years ago, L’OCCITANE revealed and patented the exceptional anti-ageing powers of Corsican immortelle – the only variety that contains an incredibly high concentration of active ingredients. Was I satisfied? No qualms whatsoever to application. It sets in favourably on my eye contour. Did not blister my skin, nor did I feel any tingling sensation. In all fairness, it did lock in moisture and hydration. Why should I lie? It did. More like a gel instead of heavy cream, appreciated natural smell and a tiny bit goes a long way. 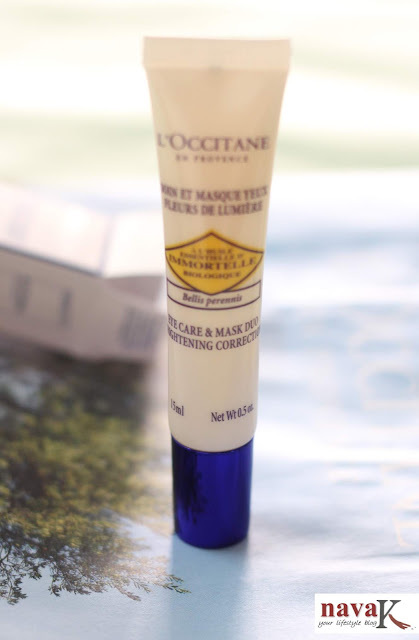 Translucent, almost colorless, L'occitane Eye Care & Mask Duo Brightening Correction in my opinion is just another eye cream. Nothing special, neither can I off hand find many particular reasons for sensationalising it. What about as a mask? Utter gutter rubbish. What? Its basically for hydrating. The same effect as an eye cream. Honestly, I was looking forward to L'occitane Eye Care & Mask Duo Brightening Correction as my saviour for lightening my dark circles and for waking me tired eyes. Unfortunately, dang! Of course its cooling properties must be hailed, but the metal piece on the tube I think is corny. In fact, I completely stop using it after the first round. By far, metal seemingly is stretching my skin when I rotate and roll it around my eye contour after applying the gel. You tell me then? Why on earth should I allow the mess of the metal to trigger fine lines on the most sensitive part of my body? My under eye area? Duh! 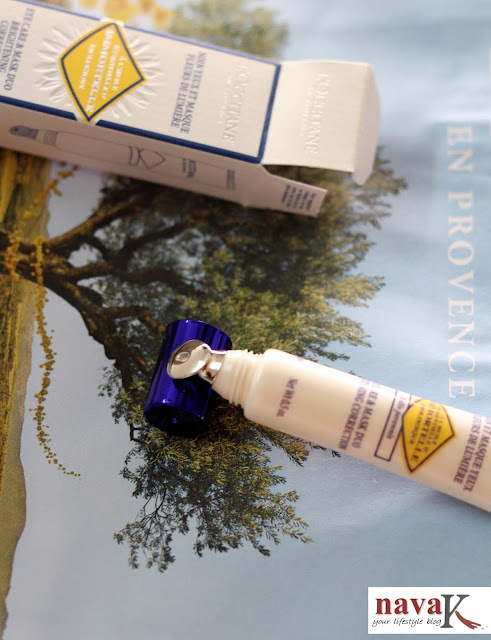 L'occitane Eye Care & Mask Duo Brightening Correction is a wrong beauty call for me. That is not all. Tube has cracked and gel is beginning to sip from the crack. Thrown. My money thrown and my hopes dashed. I had to throw instead of contaminating my eyes and even with half of the gel remaining inside. What else should I do? 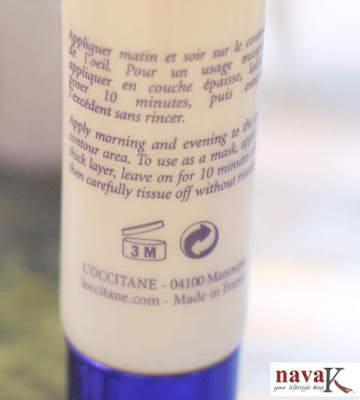 Hopefully, L'occitane UV Shield SPF 50 Whitening Moisturiser Cream which I bought simultaneously, yes, the hero me, yet to be experimented, keeping my fingers crossed its not gonna be another beauty failure. I want to buy one! Thank you for this post! L'occitane is one of my fave brands. Organic and they smell good. They're really effective too. Honest review..... Love the way to described this product... I mean the curve of starting from a cool feeling to a slight disappointment at the end.